Cardiovascular exercise is anything that gets your heart rate up, gets you perspiring, and gets more oxygen pumping through your blood. Aerobic classes like spinning, Zumba ​and step are all examples.Your heart and lungs will benefit from consistent cardiovascular exercise, along with improved circulation, increase ​in bone density, improved sleep and increases in your energy levels. Strength training is any exercise that helps different muscles in your body become stronger and more powerful. You can use weights, or even your own body weight. If you want to help tone muscles and strengthen bones then resistance work is vital. Doing strength or weight training will increase your muscle tissue. The more lean muscle tissue you have the more calories you burn. 10lb of muscle burns 50 extra calories per day, whereas 10lb of fat burns just 20 calories per day. TSo, which is best for fat loss? ​A significant difference between weight training and cardio is the type of hormonal environment they promote. Weight training tends to put the body in an anabolic state which encourages Muscle Mass Gain. Cardio training, on the other hand, promotes higher levels of cortisol release. This is the primary, hormone that encourages lean muscle loss (consider a marathon runner) as well as fat accumilation around the abdomen. and keep your calorie intake under control, weight loss will take ploace. 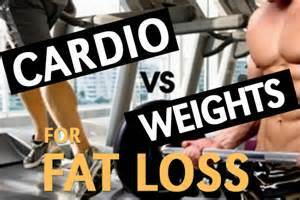 So, cardio training generally can help you lose wight (see fat loss not weight loss), however typically this loss is going to be a bit of a combination between fat and muscle. Hence, what you are left with is a smaller version of yourself. A significant feature of resistance training for fat loss is due to the calorie burn after the workout is completed. Studies have demonstrated that after a weight training workout, metabolism can be boosted for up to 36 hours post workout. So, even whilst resting rather than burning 60 calories you are burning 70 calories per hour. So! An extra 10 calories multiplied by 36 hours can make a bid difference to your daily calorific expenditure. If you multiply this over a month it shows how regular weight training sessions will really increase your calorie burning and hence fat burning capacity. Some ladies believe that weight training causes them to develop big muscles! This is an unfortunate misconception because females do not hane enough testosterone in their body to develop such a degree of musculature. So, when performing resistance training you stand a better chance of losing strictly body fat, whilst helping to enhance the natural curves of your body. Whilst you should not entirely eliminate cardio from your fat loss training programme, you should be making efforts towards weight training as well. OVERLOOKING THIS FORM OF EXERCISE WILL HOLD BACK YOUR EFFORTS TO FAT LOSS.